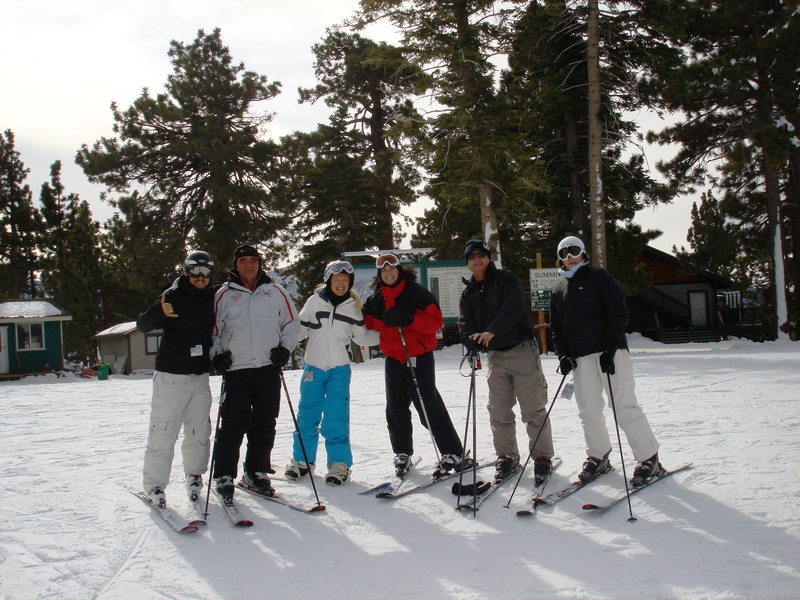 My husband Mark & I went to Big Bear last weekend with some friends and we had a blast! We stayed at our friend Steve’s gorgeous mountain home and had two days of fun in the snow. It was one of the funnest weekends I have had in a long time. Great friends and great memories. 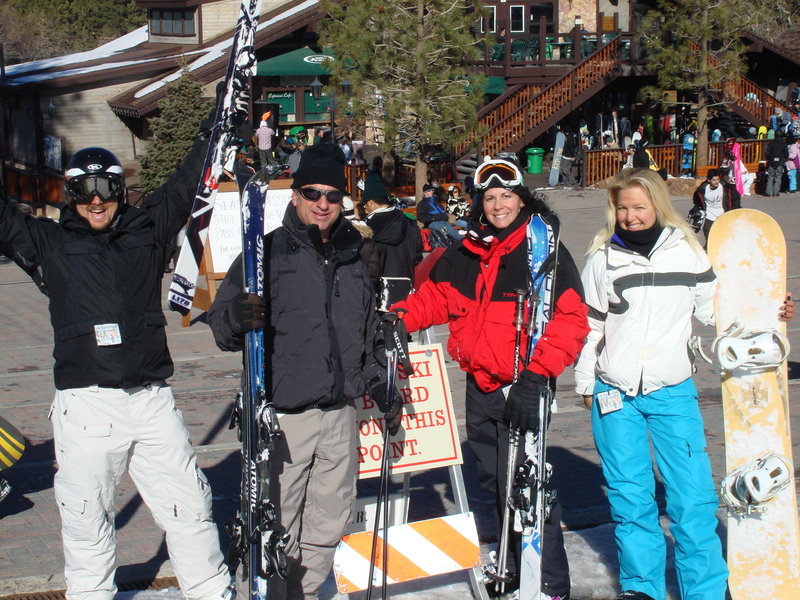 We skiied with the owners of Bear Mountain and Snow Summit ski resort. Jennifer and Rich were an amazing couple who schooled us on the mountain. Down the mountain they were so fast and skilled, I couldn’t catch them! We took a break for lunch at the mountain top lodge and the owners showed us the posters around the lodge of them and their children skiing and mountain biking, pretty cool. We all ordered our food and sat down together. I bought a garden salad and I wasn’t sure what to put on it for dressing. I didn’t like the packets of salad dressing because they contained bad for you hydrogenated oil and corn syrup. I came up with something on the fly. They had lemons, mustard, and honey (not vegan). So at the table I put lemon juice, honey, and mustard on my salad, closed the lid and tossed it all together. Everybody was staring at me and amazed at what I had just done. The dressing tasted great! Even the owners were impressed. Get creative and you can eat healthy just about anywhere you go. In the morning I made my favorite breakfast, soaked oat groats, fruit, rice protein powder, and green powder “cereal”. I made my healthy vegetarian cereal for my friends and they loved it! They were shocked and amazed at how great it tasted and how filling it was. Here’s how to make the cereal. It’s similar to my other energizing cereal. I didn’t have nuts or seeds in the video but that would be a great addition for healthy fats. This “cereal” will satisfy you, give you time released energy, and is an excellent source of all important fiber. -Drink lots of water. Higher elevation tends to cause you to get dehydrated faster. Once you are dehydrated you lose 30% of your power/energy and feel tired so stay perky. - Eat greens, superfood powders, or liquid chlorophyll diluted in water. Because there is less oxygen at high elevation the added greens can assist you in increasing your blood iron (hemoglobin) which carries oxygen to your cells. That’s what I used and I ripped it up on the mountain. - Eat a clean diet. Sludge in your diet will slow down your performance, so to be at peak performance fuel your body with nutrient rich foods. Can you guys relate to being in somewhere and having to finagle a heal thy meal together? What brand green powder is that?? Cute, I will check it out Kaitlin. Have the best year ever.